Are you looking for a jacket that has a unique flair & style? 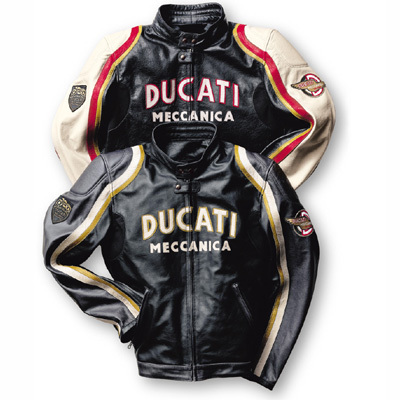 nothing says classic Ducati stylle the Old Times Leather jacket. This is a superbly styling reproduction jacket and is made in very high quality inside and out. Riding never looked so good! The old Times jacket combines modern protective armour with vintage Ducati styling. it has a Ducati Meccanica Old Times logo on the front, zippered adjustable cuffs, zipper attachment for the pants, 2 outside & 2 inside pockets. Ducati Logo in the back.